Alps Mountaineering Extreme 2 tent features a very rare- 3 pole system, which is supposed to provide stronger framework and make it easier for clips to snap directly into the tent poles because of increased contact.It can width stand a lot of what nature throws at it and includes a mesh roof for great star gazing opportunities. The Extreme tent also features awesome storage where you can put all your mucky gear whilst you relax in comfort looking at the stars, unless you have the fly roof up, which you will need, so you don’t get wet. The Extreme 2 has enough space for two people pretty easily inside, what is more impressive is the storage facilities and the fact that you can rely on this tent for 3 seasons. The vestibule space is 29 square feet, which is massive considering that this is just a two person tent. Its floor dimensions are pretty good too at 62 x 92 inches of floor space which equals about 35 square feet. Not bad for the price. Three Poles! Alps Extreme 2 has three poles. Making it one of the sturdiest and most secure tents around but you are going to have to consider that this tent will also be more difficult set up and it isn’t as easy as some of the other tents on the market to take down either. The storage space is really the best thing about this tent as it has a lot of it considering that it is just a two person tent. The attachable pole clips are great to, this tent is going nowhere in bad weather. It has this rugged frame which is probably the best thing that it has going for it. The clips and zippers are also great to, they will not need to be changed over time. It’s mesh is also very good and protects the interior of the tent being penetrated by UV rays. The tough frame alone makes this tent one of the more durable ones on the market, Alps Mountaineering Extreme 2 really will not break , we have tried! This is a two person, rugged camper tent. Alps Mountaineering Extreme 2 should be used in extreme weathers where other tents simply cannot go. It could stand up in a hurricane and width stand torrential downpours, it really is that strong! It has two doors and lots of storage space, the double wall style too also makes sure that the heat stays in and the cold stays out, it is well price but you have to remember that it fits two people max. It’s pretty much impossible to get three people into this tent comfortably. The outer wall is an olive green which suits into forestry-type setting very well. Its interior wall is white which we are not exactly sold on. If you are camping in difficult or muddy places the mud or dirt is going to be very difficult to get off the white walls. It does look very cool though! Especially with the black mesh and poles- it really stands out! Sturdy as heck! This thing will not fall over no matter what the weather is like. Very heavy considering its only a two person tent. Is a little on the small side even though it says it fits two. 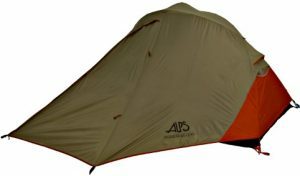 Alps Mountaineering Extreme 2 tent is one of the sturdiest tents on the market. It can width stand almost any weather that is thrown its way and it really utilizes its framework well. In this case we can call it the best 2 person tent. It has a unique three pole frame that can be a little tricky to set up but it really does need a certain amount of time dedicated to it in order to set it up. The mesh an ventilation systems work well, but as with most of these tents you have to watch the weather in order to make sure you don’t get soaked inside whilst not putting the fly roof up.